Shekinna Stricklen yells after hitting a momentum-changing three-point shot. Photo by Chris Poss. 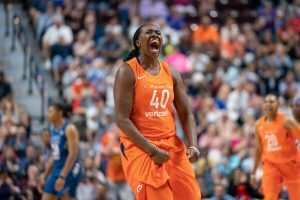 Uncasville, Conn. – It was hard to tell at times Saturday who was more fired up – the Connecticut Sun or their near-capacity crowd of yelling, clapping fans. But ultimately it was the power on the court that prevailed, as the Sun raced past the defending champion Minnesota Lynx, 89-75. 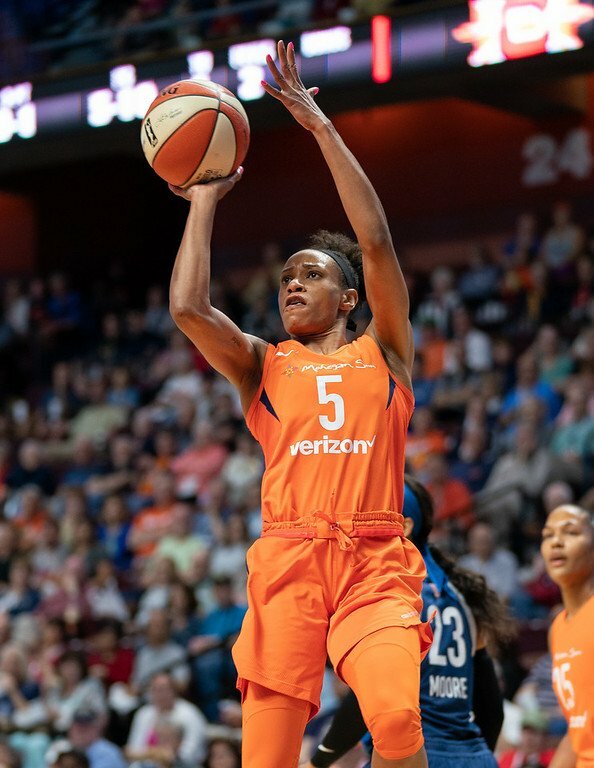 Courtney Williams led five Connecticut players in double figures with a season-high 22 points, while Jasmine Thomas added 18 and Chiney Ogwumike scored 11 points and grabbed 11 rebounds. 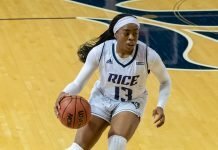 Shekinna Stricklen also netted 11 points, which included a trio of three-point shots – two of which were back-to-back, and which ignited the team and electrified the crowd. 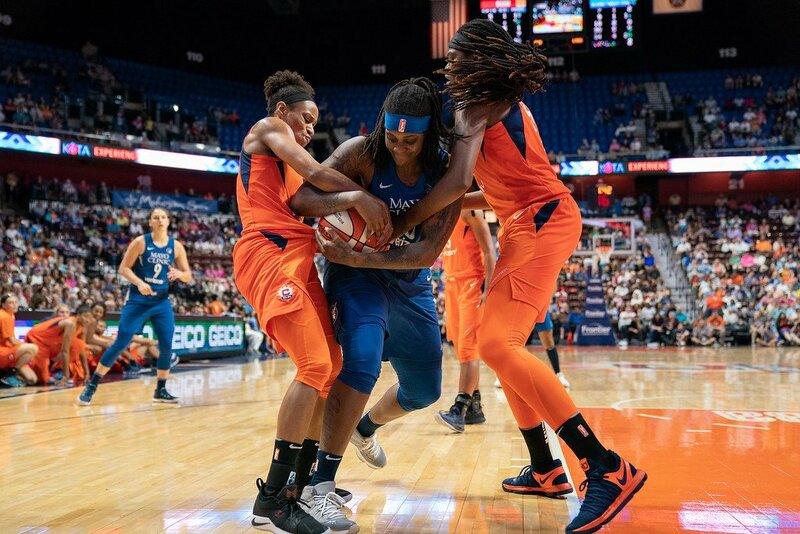 The two teams had already changed leads and tied numerous times going into the third quarter, and midway through, Minnesota had a 52-48 advantage. Stricklen hit her first three, then clenched her hands and screamed. Her second trey ignited a 19-8 run that put the hosts up 67-56 to end the period. 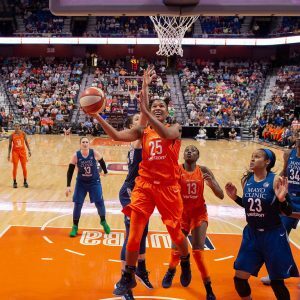 The Lynx, led by Sylvia Fowles’ 20 points and Maya Moore’s 17, helped whittle their deficit to seven twice in the fourth quarter, but after the second time – at the 6:31 mark – an Ogwumike putback sparked a 9-0 Sun run to seal the win. Thomas credited the team’s poise through the runs of their opponents. 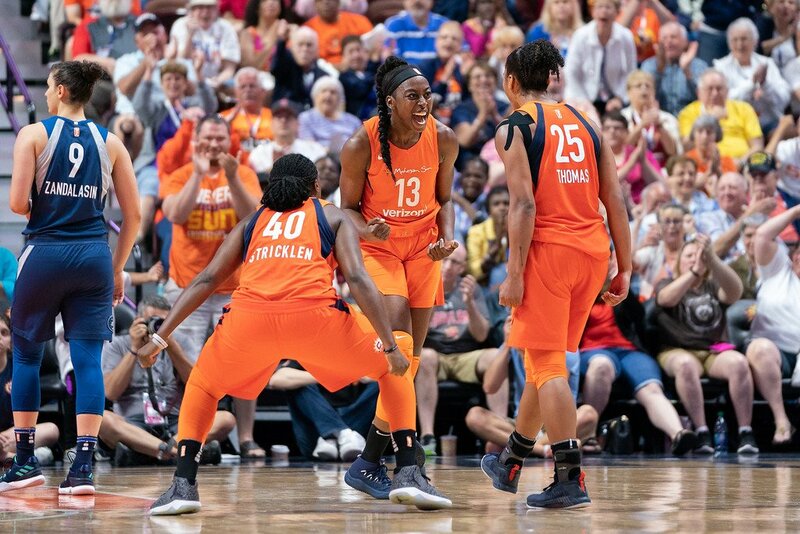 Shekinna Stricklen, Chiney Ogwumike and Alyssa Thomas exult after the win. Photo by Chris Poss. Williams said the game was a gut check for Connecticut. Coach Curt Miller credited Stricklen, who hit a game-winning three against the Liberty two days earlier, for changing the tone of the match up. The first-place Sun are 7-1 after the win – their best start in 12 years. 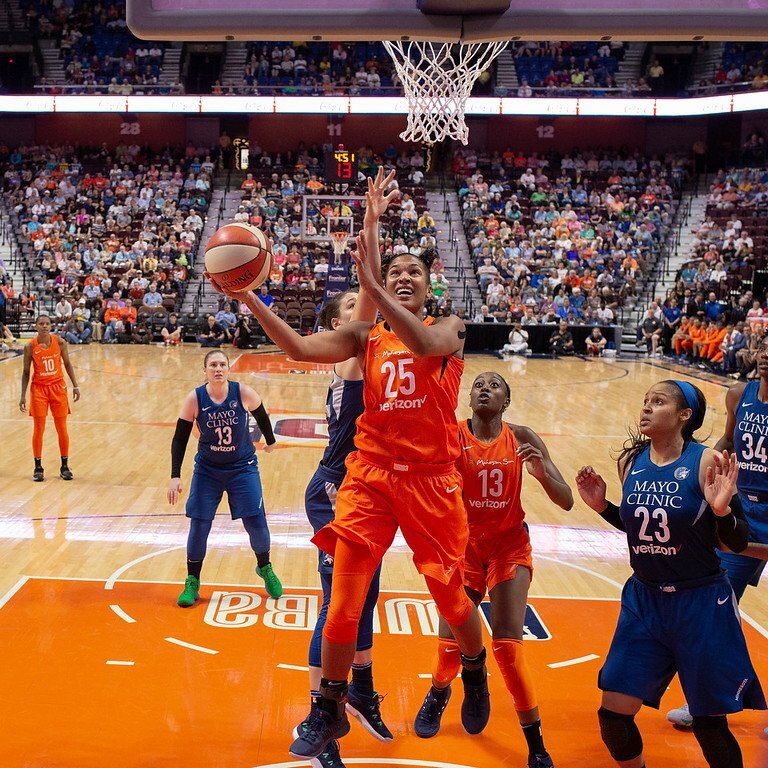 The Lynx, who have struggled on both ends of the floor the first three weeks of the season, are a surprising 3-6, which included a four-game losing streak. 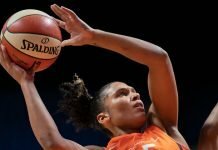 Fowles said her team let opportunities slip away. Jasmine Thomas and Jonquel Jones battle Lynetta Kizer for ball possession. Photo by Chris Poss. Moore said Minnesota needs to play together as a unit. The Sun went 4-1 playing five games in nine days, in different cities. Miller called the feat “remarkable,” and said he is proud. “They believe in each other, they care for each other, and they play for each other,” he said. Alyssa Thomas goes up for a layup. She had 11 rebounds for the game. Photo by Chris Poss. Both teams get some needed time off over the next few days, as the WNBA schedule has been compressed this season to compensate for the FIBA World Championships in the fall. Connecticut hosts the Mystics Wednesday, and the Lynx host the Liberty Saturday. 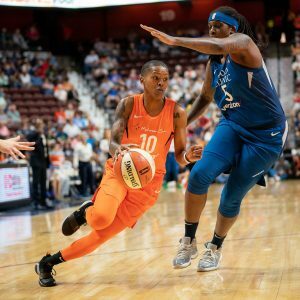 Courtney Williams drives past Lynetta Kizer. Photo by Chris Poss. Jasmine Thomas hits a shot for two of her 18 points on the day. Photo by Chris Poss.